Summary: Donor 3319 Profile: Tall. Blonde. Blue eyes. Two months pass, and Christine is happily pregnant. But one day, she is shocked to see a young blond man on the TV news being arrested for a series of brutal murders&mdashand the blond man bears an undeniable and uncanny resemblance to her donor. Wow! 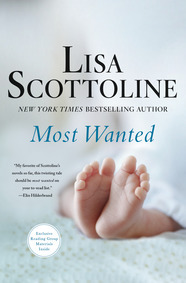 I could hardly believe my eyes when I read the premise for the lastest suspense novel by Lisa Scottoline titled MOST WANTED. The circumstances surrounding the main characters in the book are just a nightmare. And that's only the beginning of the horrors they face! MOST WANTED begins when Christine Nilsson is enjoying herself at her retirement party. After years of struggling with infertility and discovering that her husband in sterile, Christine is newly pregnant with the help of a donor. Excited to start her family, she has decided to stay home with new baby and not return to her job as a teacher in the fall. At this party, Christine can't help but notice when the news shows a young blond man being arrested for the murders of multiple women; and this man looks an awful like like her sperm donor. Naturally, Christine is determined to get to the truth... even if that means discovering some unexpected things along the way. See what I mean? Can you imagine finally being pregnant and then learning that the baby you are carrying is possibly the child of a serial killer? MOST WANTED is not only a suspenseful mystery, but it's also explores some pretty serious moral and ethical dilemmas. Overall, this book is an entertaining read and it's also a story that makes readers think! And those things definitely make it a great book to read. First and foremost, MOST WANTED was an intriguing read that captured my attention from the beginning to the end. The novel was pretty long, coming in at over 400 pages; however, the story was fast paced and exciting enough to keep my attention. I was desperate to discover whether Christine was carrying the child of a serial killer, although I did question some of the ways she went about finding out the truth... and keeping things from Marcus. When things took a turn for the worse and Christine found her life (and her baby's) at risk, my stomach was just sick. I guess that's a testament to how vested I was in the story! What I also appreciated is that Ms. Scottoline took the time to fully develop the characters of Christine and her husband Marcus. This couple had been through a lot with the fertility struggles, and Marcus was definitely having some issues with what he perceived as his inadequacy. When Christine began to suspect that her donor was the same person who was arrested, she had one reaction and Marcus was experiencing some very different ideas about their unborn child. The way the author explored their relationship, while very depressing, was also very realistic to me. As much as I enjoyed MOST WANTED, it wasn't a perfect story. I felt as if the first half of the novel, where the author set up the story and established the relationships between the characters, was stronger than the second half. There were way too many coincidences to make it believable, and the ending was wrapped up a little too neatly. However, I'm not sure I would have enjoyed the book as much if everything hadn't worked out. Does that make sense? MOST WANTED definitely delved into some complex legal and moral issues that made me think (and even cringe!) The mystery was also suspenseful and fast-paced. I suspect fans of Ms. Scottoline's will enjoy her latest story and readers who appreciate smart mysteries will too! Great review! I have read quite a few books by Lisa Scottoline and I always find them to be well-written, compelling, and diverse as far as legal issues. I will read this one for sure. I've never read Lisa Scottoline and I don't know why. Her books always look so intriguing. Maybe I'll give this one a try.